In the Bitcoin mining industry, Chinese miners are major players. 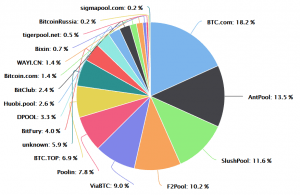 For example, at the time of writing, two largest mining pools — BTC.com and AntPool (both owned by Chinese mining hardware giant Bitmain) — hold nearly 32 percent of the Bitcoin network hashrate, which essentially measures how much computing power is needed to maintain the network. China’s state planner, the National Commission for Development and Reform, seeks public opinion on whether Bitcoin mining should be banned immediately, Reuters reported, citing the Commission. (Updates throughout the text.) Bitcoin mining was included in the draft list of industrial activities that the agency seeks to stop, as it did not comply with relevant laws and regulations, were unsafe, wasted resources or polluted the environment, the report stated. Up until May 7, the public can comment on the draft. If the new rules are enacted and Chinese miners are forced to move abroad, “Bitcoin mining will no longer be dominated by China but will become more decentralized,” South China Morning Post quoted Michael Zhong, an analyst with Beijing – based cryptocurrency research firm TokenInsight. “If this ban ends up happening its more likely to push up BTC prices than down. Loss of cheap Chinese electricity would raise mining costs, which is net price – positive. It would also serve to kill the FUD that Bitcoin mining is centralized,” tweeted Mati Greenspan, senior analyst at eToro social trading platform. According to the news, in the past hour, Bitcoin has risen by 0.29 percent (07:16 UTC) and has fallen by 0.19 percent in the past 24 hours.